Where does the time go? 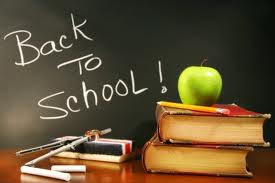 Next week brings the end of summer vacation and the start of the new school year 2012-2013, and with it new beginnings for many. Here at St. Joseph Parish, we welcome Veronica Pereira to our Pastoral Team! Veronica, a parishioner of St. Joseph Parish, will be the Campus Minister responsible for the co-ordination and delivery of pastoral activities on the UTM Campus. 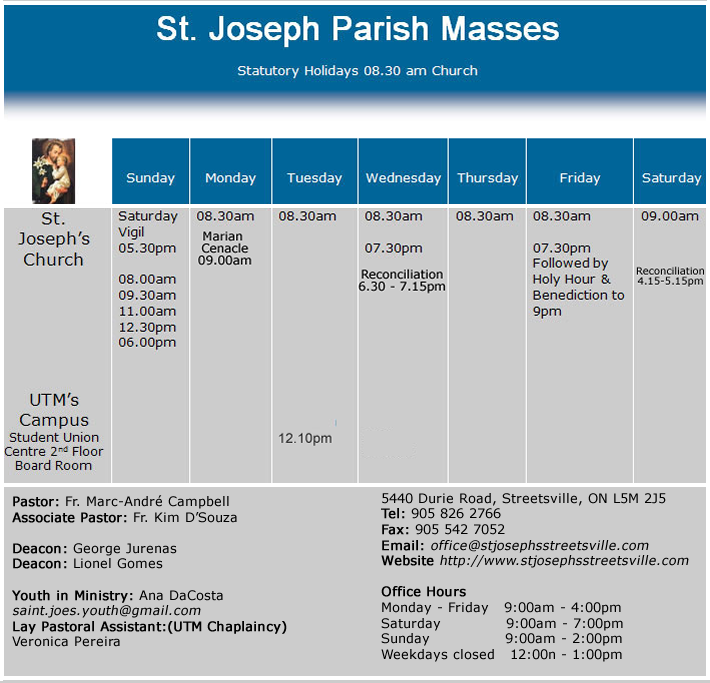 The UTM Chaplaincy, to which I am Chaplain, is run and funded directly by the Archdiocese of Toronto. Veronica, has previously taught at the university and is a person of profound faith. She is committed to making our faith accessible to our young people at university. I trust that you will join me in welcoming Veronica and wishing her well in her work at the university. Time does pass quickly. In this busy life with all its time constraints, may all of us always find the time for Him, our gracious and loving God. As we go forward, may God continue to bless and guide us. Tuesdays at 12:10 p.m. in the Board Room (2nd floor of the Student Centre). All students, staff and faculty are welcome to attend. Email utmcatholics@gmail.com for more info. Each year in the Archdiocese of Toronto, a tremendous amount of energy and resources are devoted to the annual appeal, ShareLife. 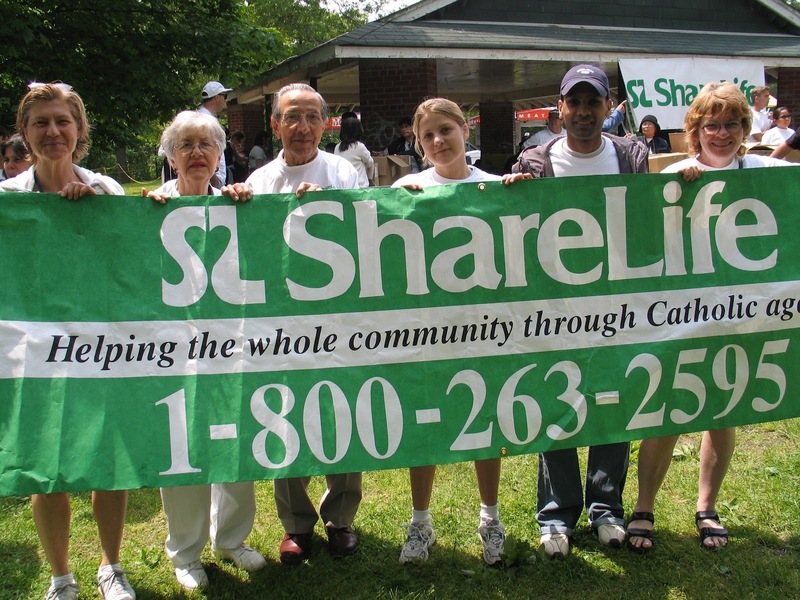 It's an opportunity for all Catholics to mobilize around one basic call each one of us has as Christians - to reach out to the poor and marginalized.The ShareLife campaign supports more than 250,000 people every year through its support of 40 different agencies. In short, we're not just helping Catholics, we're helping anyone in need who turns to a ShareLife agency for assistance.With final results announced this week, Catholics throughout the Archdiocese should feel proud that the charity has surpassed its 2012 goal by raising $14,934,663, just shy of $15 million, a 9.4% increase from 2011. For those not familiar with the ShareLife Appeal, there are a number of targeted campaigns that contribute to the overall result. These include corporate, school and parish campaigns in addition to bequests and in-memoriam gifts that are made each year by those who remember ShareLife in their will or after the passing of a loved one and wish to leave a lasting legacy. A special thank you to clergy, parish staff and parishioners who gave of their time, talent and treasure most generously this year. The 2012 ShareLife parish appeal raised $12.33 million surpassing the $12.3 million goal, an overall increase of 7% from last year. It's no secret that fundraising in today's difficult economic climate is not easy. The ShareLife campaign was blessed this year with an anonymous donor who pledged to match new and increased donations up to $650,000. The matching gift had a tremendous impact on the overall result of the 2012 appeal. Donors can also feel confident in a gift to ShareLife, armed with the knowledge that they remain one of the most fiscally responsible charities in the country, with only 9 cents of every dollar going towards fundraising and administration costs. We all want our charitable dollars to be stretched to the max - ShareLife is doing just that. You can learn more about the charity by visiting their website - heck if you're inspired to give (the 2013 campaign is already underway) you can make an online donationhere. So whether it's a new immigrant looking to call Canada home, a single mom seeking support, seniors looking for quality care, a child with special needs finding the support they deserve, ShareLife and its agencies are truly working wonders. To all those who have worked so hard over the last year to make the campaign a success, a hearty thank you. This includes the many folks who are quietly and humbly working each week: agency representatives who give of their time to speak at Masses throughout Lent to highlight the appeal; teachers or students who coordinate a ShareLife event at their school; corporate canvassers who assist in highlighting the efforts of the charity in the workplace and of course the very capable and hard working ShareLife staff who diligently work to make it happen, ever mindful of the quarter of a million individuals who will be served by ShareLife agencies each year. 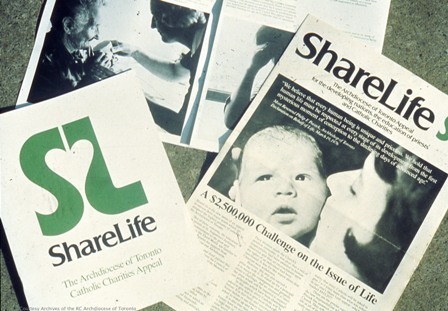 ShareLife has come a long way from its beginnings in 1976, with Catholics going door to door that first year to raise just over $2 million. Yet the mission, vision and goals remain essentially the same: to model the example of Christ to serve the poor and marginalized, to put others before ourselves, to give without counting the cost, to value the sanctity of every life!Thanks for helping ShareLife go "over the top" in 2012. Remember, the life you change may be the person sitting beside you on the subway, at church or even a friend or relative. There's a real joy in sharing - let's not stop now and together, we'll keep working wonders! for everything which holds promise and brings us joy. Help us to make the most of every chance we have to start afresh. May we show love to one another and to all. remind us that you give us chances to start over again and again. as we receive your forgiveness. Help us to learn and to work together. and when it is better not to speak. Help us to be good friends this year. with ourselves and with others. Bless our school and keep us safe. Be with us as we travel each day. shown to us in the people around us. In school and at home. and to say sorry when we need to. Giving thanks and glory to God as she did.